Use your mobile phone as Bluetooth Modem | Jesus created science, we explore and enjoy it! I thought I would throw this trick out so that someone will get benefit. You can use this trick with most mobile phones but it is tested in Nokia E-Series. I will be grateful for feedback on other mobile phone too. 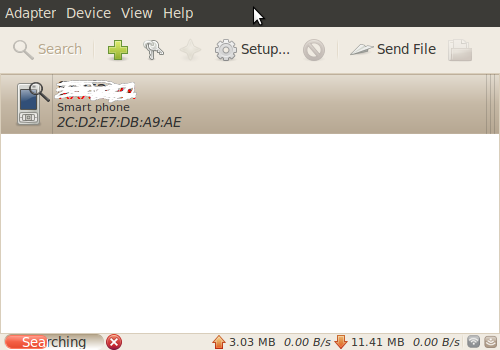 And…this is Ubuntu thing, though it can work in other Linux distributions too! Voila! You just installed it! If you think you are Linux maverick, then download latest version and do the commandline stuffs that I will not cover here! Now to be sure you installed it, you will see two blue-tooth icon on panel, one for native Gnome and another for blueman. Then you are ready to go! If you cannot see the icons, repeat the process. If fails, post a comment and I will try to help! Once blueman is installed, then you are ready to go! start blueman, either by clicking an applet icon on blueman manager or by typing blueman-manager command on bash. If you did right, you will get window similar to one below! Good! Then select the phone in the list and click add tool-button (a small green + image on th toolbar) or right click device and then click add device (or something like that). Then add device to list of trusted device by clicking little star-like tool-button. As in any other case of pairing, blueman will ask you pairing PIN, put anything like 1234 or 3333 or anything in screen. Your phone will prompt you for the same. Enter the same code. If no error encountered, then your applet must change and have little green “dot”, just like shot below. If not post errors you get! That is right. Your mobile phone will be added to your phone. 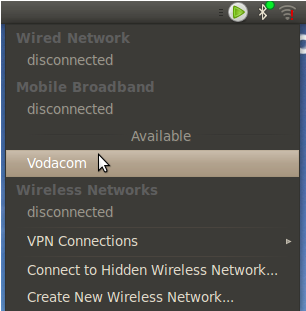 If not add it as Mobile broadband. If you don’t know how to do it, post a comment and I will be happy to think of tutorial. Since previously I added it when using USB port, the device came automatically! The screenshot is as shown below! Click the device and it will connnect! Glory be to Jesus My Lord, and enjoy all of you! 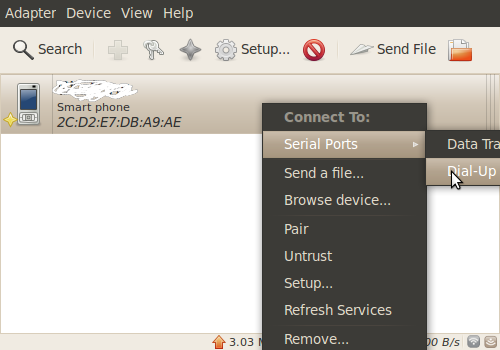 This entry was posted in Ubuntu Tips and Tricks by Stefano. Bookmark the permalink. Thanks to David Childers of Daniweb for pointing this important detail!